This article will describe analyzing boot time. printk is a log function in kernel. When CONFIG_PRINTK_TIME is enabled, printk has a timestamp. 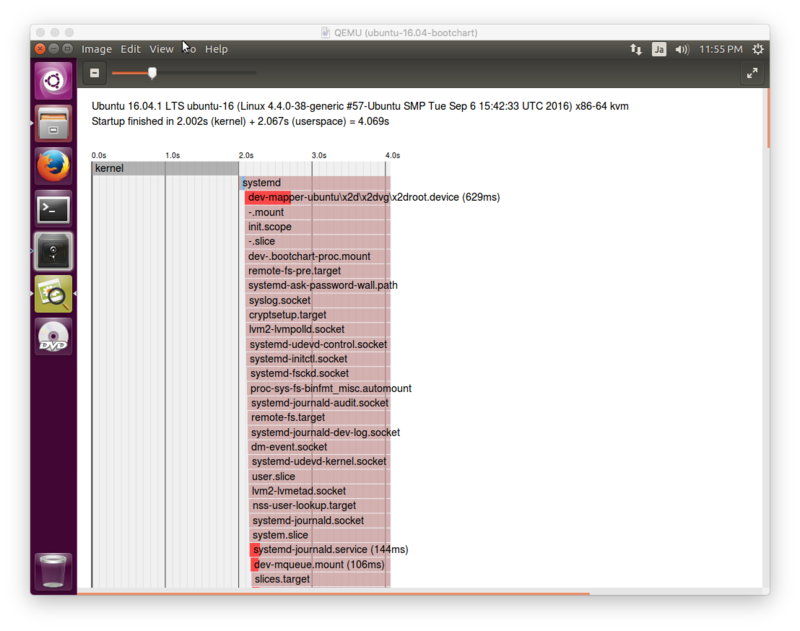 Because CONFIG_PRINTK_TIME is enabled by default on Ubuntu 16.04, you can analyze kernel boot time with printk's timestamp. When starting initrd, root filesystem is not mounted yet. syslogd and journald is not running yet. It is difficult to save initrd's log to userspace. This article will redirect initrd's stdout to /dev/kmsg and save initrd's log to printk's buffer. Take a backup of initrd. Move original init script to scripts directory. /dev will be used by original init script. Create /printk directory and mount devtmpfs to /printk. Execute /script/init and redirect stdout to /printk/kmsg. busybox's ash cannot write stderr to /dev/kmsg. /bin/sh -x cannot be done. busybox's hush can write stderr to /dev/kmsg. But original init script cannot be completed. Update initrd and reboot Ubuntu 16.04.
dmesg's output is as below after reboot. [    1.688616] Begin: Loading essential drivers ... done. [    1.689657] Begin: Running /scripts/init-premount ... done. [    1.947036] Begin: Running /scripts/local-premount ... done. [    2.068452] Begin: Running /scripts/local-bottom ... done. [    2.072004] Begin: Running /scripts/init-bottom ... done. [    3.146419] systemd: Detected virtualization kvm. [    3.148571] systemd: Detected architecture x86-64. initrd's log is between "[ 1.570844] Loading, please wait…" with "[ 2.072004] Begin: Running /scripts/init-bottom … done.". If you need more detailed log, you need to add echo statement to scripts in /usr/share/initramfs-tools. systemd-analyze provides boot time of kernel, initrd and systemd. This is the replacement package of bootchart. Boot time of initrd is included in boot time of kernel on Ubuntu 16.04. "systemd-analyze blame" outputs units by consumed time. "systemd-analyze critical-chain" output unit path which consumes the most time. @ means start time and + means consuming time. graphical.target is leaf node and .slice is root node. But systemd is running in parallel, if you shorten 500ms from this path, userspace might not be shortened 500ms. "sykstemd-analyze plot" outputs plot as svg file. This helps you to understand overall userspace.